William Morrow Paperbacks, 9780062012326, 384pp. Emily Arsenault’s compelling debut, Broken Teaglass, was resoundingly praised (“Quirky and inventive...meets all the definitions of a good read.”—Richmond Times-Dispatch). With her intelligent, complex, and ingeniously crafted sophomore offering, In Search of the Rose Notes, Arsenault validates her standing as an exhilarating new voice in contemporary fiction. A moody and engrossing mystery, In Search of the Rose Notes follows two best friends from childhood who once unsuccessfully investigated the disappearance of their teenage babysitter, and now, in their twenties, attempt once again to uncover the truth. Readers who love the literary, female focused mysteries of Laura Lippman, Tana French, and Jennifer McMahon will be thrilled to add Emily Arsenault to their must-read lists. Emily Arsenault is also the author of The Evening Spider, The Broken Teaglass, In Search of the Rose Notes, Miss Me When I’m Gone, What Strange Creatures, and the young adult novel The Leaf Reader. She lives in Shelburne Falls, Massachusetts, with her husband and daughter. ...a compelling psychological mystery, told from the alternating point of view of the 20-something narrator and her confused preteen self. ... Instead of dwelling on fear and pain, Arsenault guides the reader through grief, compassion, and understanding in this emotionally complex and deeply satisfying read. 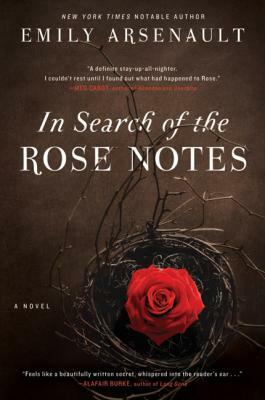 Emily Arsenault’s absorbing second book, “In Search of the Rose Notes,” is at least as much a novel as a detective story.... Ms. Arsenault here reveals strange truths beneath everyday surfaces and shows that truth sometimes isn’t all that strange.